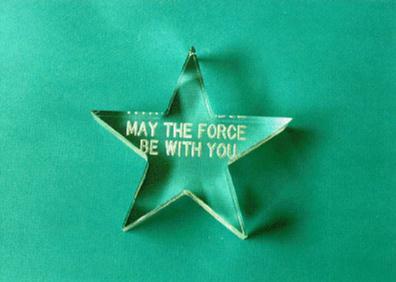 These May The Force Be With You lucite stars were given out to the cast and crew of Star Wars at celebrity screenings. They came in clear plastic boxes with a ribbon around the box. The writing is etched on the "back" of the star and the lucite magnifies the text a bit in this photograph. The star has a sticker on the side from Two's Company, the company that made these for the cast and crew.